New Targeted Offers: CNB 100K, KAL 30K, Chase Freedom Unlimited $325 Cash & A Terrible Amex 250K Bonus! There’s some new offers available today, on a few different credit cards. It wasn’t easy to fit them all in one title, but here we have more space, so let’s take a look at all of them. City National Bank has extended a targeted offer for the Visa Commercial Credit Card, which is a business card. It’s a great bonus but it also requires a great amount of spending. Earn 100,000 Bonus Points after spending $15,000 or more during the first 90 days after account opening. The bonus is worth $1,000 which is pretty good, but it requires $15K in spending which is not easy for most people. It is a targeted offer and on top of that CNB is pretty thorough with their approval process. Sould be worth it if you’re targeted and can manage the spending. It is 6.66% cashback on top of the 1% you earn on all purchases. US Bank is offering a 30,000 miles sign-up bonus on both the personal and business vesions on the Korean SKYPASS Credit Card. The offer was sent to some customers by email but there’s no targeted language in the offer page, so everyone interested should be able to apply. Additional 15,000 Bonus Miles after you spend $2,000 in net purchases with your card in 90 days! This is a decent offer on both cards, but recently we’ve seen higher targeted offers, 45K and 50K respectively. This is the highest public offer we’ve seen though. 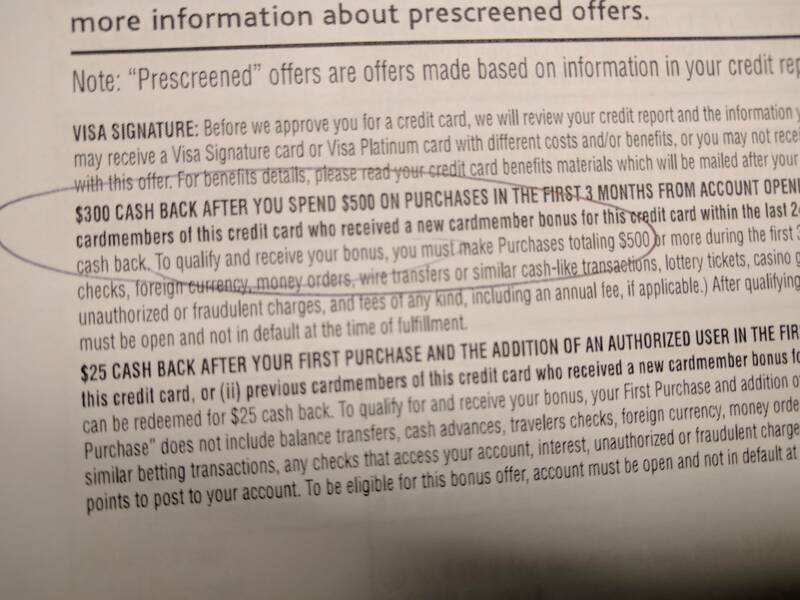 Chase has a $300 in-branch pre-screened offer for the Freedom Unlimited card. Earn $300 Cash Back after you spend $500 on purchases within three months of account opening. This card falls under Chase’s 5/24 rule but if you’re pre-approved in branch you should be able to bypass it. It is the highest offer we’ve seen for this card, and the bonus should be worth more than the spending requirement for most people. You just need to have a Sapphire Preferred or Ink card so you can transfer cash back to UR points. If you recently applied for this card for the lesser bonus, then it might be worth a shot at asking to be matched for this better offer. Chase is usually pretty good at matching public offers, but sometimes they also match targeted ones as well. And now the highest and the worst bonus on this post. American Express has a new targeted spending bonus for the Business Platinum card. Earn more for your Business Earn 250,000 Membership Rewards points after you spend $1,150,000 on purchases with your card. Yup, you read that right, $1,150,000 on purchases. So you’re basically getting an extra 0.22 MR points per dollar on your million dollar spending spree. Next articleAmazon Scam Follow Up: Fake Tracking, Shutdown Accounts & A Final Resolution! That 250k is great if you were going to spend that amount anyway. Makes this card a 1.72 MR card for the first 1,150k at 5k+. Not a bad offer at all. So no more CNB personal card bonus offer?